We've been noticing a trend in wedding invitations: custom illustrations! What a great way to add a little personality or unique flair to your wedding invitation. 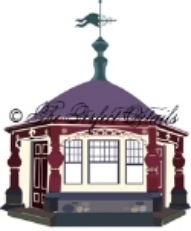 The most common illustrations we do at The Perfect Details are architectural. But we have done illustrations of lace or veils as well! If you're interested in a custom illustration, let us know and we'll be happy to work with you! 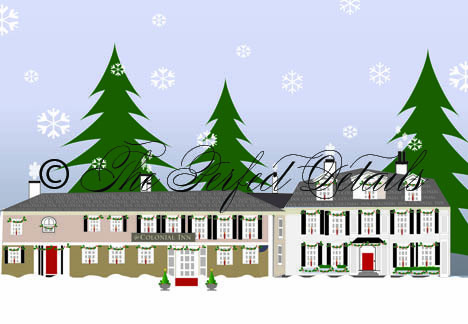 This is one of our most popular illustrations of Concord's Colonial Inn in Concord, Massachusetts. This is a winter scene but we are working on a Patriots' Day/ Fourth of July version! Stay tuned for that! This custom illustration of a portion of a bride's veil was used on her wedding invitation and other paper goods. See the wedding that used this illustration by clicking here. A Vermont Farm Scene inspired by a pen and ink illustration. Trending Tuesday: 5 Ideas for an Oscar themed Party!